Bishoujo Senshi Sailor Moon Wallpaper: "Mars' Might Fire"
Minitokyo »	Bishoujo Senshi Sailor Moon Wallpapers » Bishoujo Senshi Sailor Moon Wallpaper: "Mars' Might Fire"
This wall was created for Wallpaper Games-2: Match 03: Fire Elemental. At the beginning of making this wallpaper I wasn't sure what image of Sailor/Senshi Mars I was going to use. I wanted to use one of her from the 'Super S' season but couldn't find an image that matched the Match 03 rules. As well as one I wanted to vector out but it wasn't without the effort searching. Like these images but not all are shown. So, I ended up finding these many image. All wonderful and some from 'Super S'. But after debate and trial and error. I had a hard time in choosing the image that I found at the Three-Lights.net page. Beautiful SM scans. I had issue choosing between them because one was 'Super S' and the other 'S' season and because with the 'S' image I knew I had a wallpaper from a long time ago that I wasn't sure was an 'actual' Sailor Mars image from the show. So, when I seen the image in the scan from Three-Lights.net. I was surprised. I debated a bit longer because I don't like to create something from an image that I know has already been used or done. So, after a while it was decided this was the image that I could fully complete and followed the Match rules. And it was my 'unofficial' favorite image. And I am very glad that I ended up deciding to use it. 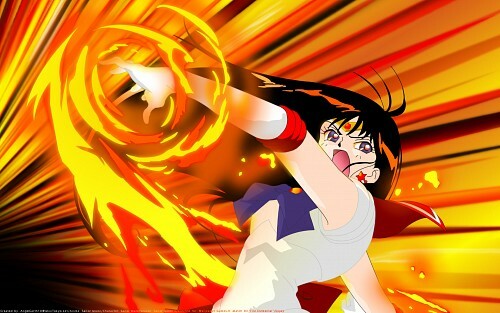 The Vectoring process of Sailor Mars and her fire was a lot, a lot, of fun. Watching it all fall into place and everything. But like all things as the background grew and changed I had to do the same with the vector. But it was still lots and lots of fun. Now, the background I wanted to do something different with it but that didn't really happen. When your center piece is such an eye catching piece of artwork. The background is only meant to help the center piece shine. Of which came over time. If you can believe that. But I can honestly say that this wall has surprised me in what I have learned over the years with vectoring technics, GIMP functions, and just an eye for detail. Has all come together to create one eye popping and extremely sizzling Senshi wall. Ooh, nice work extending the fire in the scan! I agree that the render is enough and didn't need an overly complicated background; the "sunburst" really makes this look like a screenshot of a battle! Kudos for adding light from the flames on her outfit, though I'd remove the red parts from the eyes as they look distracting. I thought the colors of it made it warm, when i see that pick it feels warm cause of the colors and fire :3 and your right everything feel in place great.